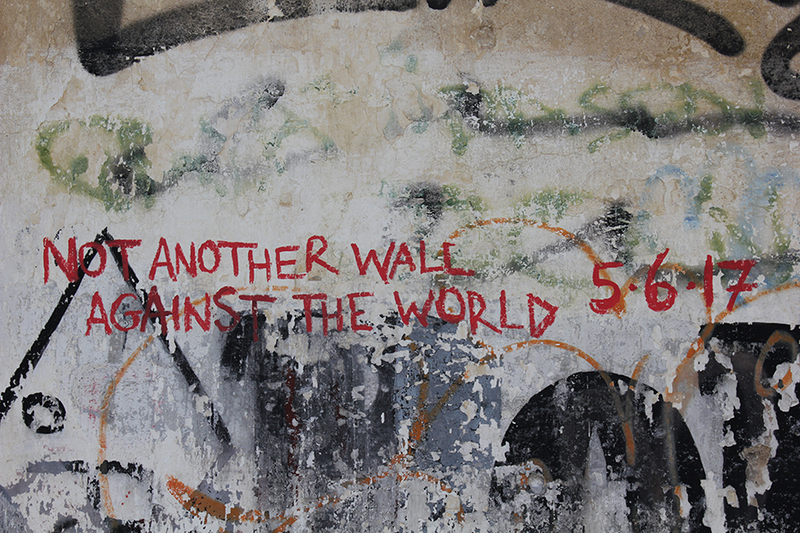 Not Another Wall Against the World is a collective artistic intervention in the public space. Athenian street artists and refugee artists collaborate in order to create together a mural. In other words, old and new residents of Athens leave their own mark in the city by painting it. Their partnership transcends linguistic, religious and cultural boundaries and showcase a message of unity. This project is a step of expression for artists who wish to experiment and show that, even under difficult circumstances, we are capable enough to overcome the borders-walls spread between us, in a creative way. Not Another Wall against the World seeks to raise awareness on issues relating to equality, human rights, respect for individuality and diversity, as well as contributing to the smooth coexistence of people within a city, where free expression and collective action are encouraged. This project was occasioned by the way all people -refugees or not- are treated, in a period of social and political turmoil, which is burdened by human flows and movements. On Monday, 5th of June, the artists Blaqk, RTM1, Azimi, Emal, Madina and Nakam from Greece, Afganistan, Syria and Irak, create a collective art piece at Falirou street in Koukaki, just right across BelRay Bar. At the same time, the public will have the opportunity to create a second collective artwork on the same wall. Both art pieces will be painted on wooden surfaces, in order for it to travel in other places as well, transmitting its message. After 18:00 a big celebration will be held on the street, after the completing of the mural. A documentation video is going to be created for the purpose of spreading the project’s message out of Athens’ borders and around the world. Find more about NEBULA here.